It is widely expected that BO will kick off the 2012 presidential campaign season by filing paperwork this coming week, possibly as early as Monday, with the Federal Election Commission - the regulatory agency created to administer & enforce the statute that governs the financing of federal elections - thereby officially indicating he seeks reelection. Filing with the FEC allows BO to start raising money for the 2012 campaign that is expected to shatter records in political spending - thereby providing the funds for him to use all of his Alinsky method community organizing skills that got him elected in 2008. Most of us think BO has never left the campaign mode since he became a national figure. Now in a scoop of all of the major broadcast networks our SC businessman provides this link of BO's first 2012 TV ad . Now after watching the above spoof BO video please notice that there is no contrast between its facetious points & this real video that I researched of Newt Gingrich flip flopping on his position regarding Libya. We are a long way from November 2012 but we certainly can say that BO & Newt really DQ themselves already based on the above two videos. 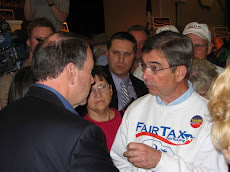 Mike Huckabee points out in his latest book, A Simple Government, that the experts & just about everyone else thought it would be Hillary & Rudy squaring off in 2008. So don't be fooled by early polls. 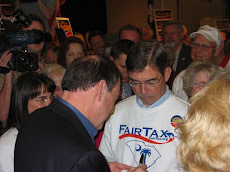 Just keep looking for people like Mike Huckabee, Jim DeMint, Herman Cain, & Mike Pence - they all pass my litmus test - you will get the FairTax if one of them is elected President. The BO video is quite a spoof...and I agree that Gingrich's flip flopping DQ's him. Tonight I heard Brit Hume say that all the money that BO pulls in will not help him come election time if the people are really dissatisfied with his job performance.